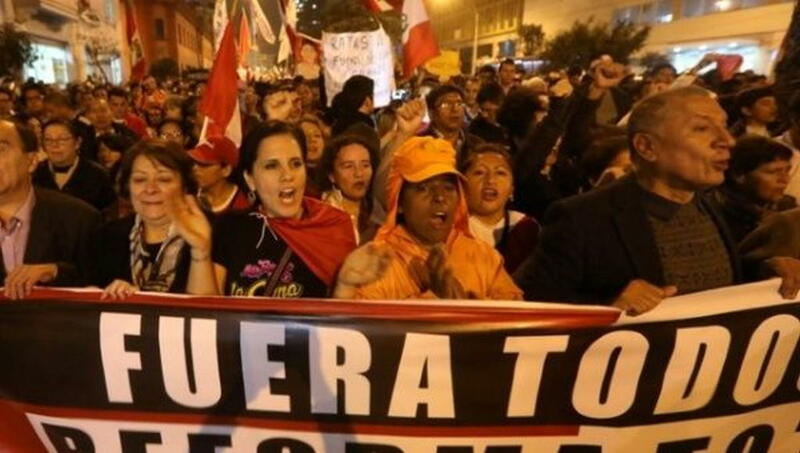 Peruvians took part in protests in cities including Cusco, Arequipa, Tacna, Iquitos Thursday. Peruvians marched in the streets across the Andean country late Thursday, many carrying effigies of rats or vultures, to demand anti-corruption reforms clean up the country’s institutions following the resignation of the head of the judiciary. Peruvians took part in protests in cities including Cusco, Arequipa, Tacna, Iquitos Thursday, media reported. Peruvian President Martin Vizcarra fired his justice minister, Salvador Heresi, on Friday after a TV station released audio of a phone conversation between the minister and a judge under investigation for influence peddling. One judge has been arrested, and another has been barred from leaving Peru. All deny wrongdoing. Vizcarra has promised to start a significant reform of Peru’s justice system later this month and summoned Congress to an emergency legislative session Friday to oust all members of the National Council of Magistrates, a 7-member panel that selects and oversees judges and prosecutors.